In Europe the name Hoffmann-La Roche is one of those company names that’s just as recognisable as Coca cola, Louis Vuitton or Adidas. Even before I first set foot in a McDonald’s restaurant – anyother one of those immensely recognisable brands – as a small child, I knew what Roche’s business was all about. And you probably did too. It’s what sets Roche apart from other companies and what makes its 28-year-long dividend growth streak possible. That’s right, Roche (VTX:ROG) is one of the few companies able to boast an increased dividend payout for the 28th consecutive year already in 2015. As a dividend growth investor, it’s fantastic to hear that Roche is not only worthy of its strong brand name, but that it also manages to capitalise on its household presence. As such, I believe the Swiss pharmaceutical deserves a place in any dividend growth investor’s portfolio. Hoffmann-La Roche was founded in 1896 by Fritz Hoffmann-La Roche and has since skyrocketed to become the third-largest pharma company worldwide based on its 2014 revenue of 47.46 billion Swiss Franks. With its headquarters located in Basel, which is also the home town of Novartis (VTX:NOVN), Roche operates worldwide under two divisions: Pharmaceuticals and Diagnostics. Its Pharma division makes Roche one of the world’s leading providers of clinically differentiated medicines. With a strong focus on innovation, the company has managed to become the number one biotech company worldwide and a strong provider of cancer treatments. As such, the majority of Roche’s development pipeline consists of biopharmaceuticals and cancer treatment. The second pillar of Roche’s strong foundation is its Diagnostics division, which develops diagnostic tests geared towards early detection, targeted screening, evaluation, and monitoring of disease. Because Roche is active in all major market segments, it can take advantage of its all-encompassing presence to provide integrated solutions to its customers. In doing so, Roche has gained a significiant competitive advantage over industry peers. With the healh care sector likely to benefit from an ageing demographic and growing emerging markets, Hoffmann-La Roche could be in a fast lane to continued success. On top of that, Roche has one of the youngest and most profitable product porftolio’s. Its popular cancer therapies, Avastin and Herceptin, retain patent exclusivity for at least another five years, for example. Actemra, an antibody drug designed to treat rheumatoid arthritis, is also expected to reach blockbuster sales, both in Europe and North-America. Potential investors will also be happy to hear that Roche’s development pipeline contains around ten drugs that could make it to the market over the next few years. Much of Roche’s development effort is focussed on different applications of already succesful drugs like Avastin. By applying this strategy the company hopes to extend the lifetime of its patents, thus securing billions in future revenue. However, by doing so, the pharma company’s competitors have managed to get ahead in other areas. Johnson and Johnson (NYSE:JNJ), for example, makes for fierce competition in the diabetes and glucose metering business, while Bristol Myers (NYSE:BMY) and Merck (NYSE:MRK) are pulling ahead in oncology antibody research. Of course, the success of competitors in different pharma sectors has little effect on Roche’s profitability because one should always analyse drug markets seperately. When JNJ manages to succesfully market a diabetes drug, there will be little to no effect on the profitability of an existing cholesterol drug by Roche, for example. More worrisome, however, is the possibility of increased competition from Novartis after its acquisition of GlaxoSmithKline‘s (LON:GSK) oncology business last year. 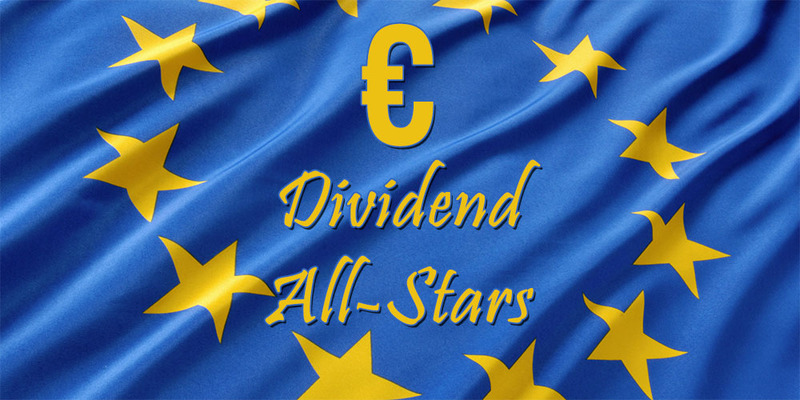 Currently Roche yields a healthy 3.09%, which amounts to 8.0 CHF in gross dividends per share at the current share price of 258.80 CHF. Because the Swiss Frank is no longer pegged to the Euro and as a result appreciated strongly, Roche shares are now trading closer to their 52-week low price of 238 CHF. About two months ago investors had to pony up 295 CHF for a single share of the pharma company. Even though the Swiss drug maker boasts an impressive 28 years of increased dividend payments, growth has been slowing down over the past few years. While the 10 year dividend growth rate stands at 14.87%, the 5 year DGR remains a more modest 5.92%. Currency headwinds might put further pressure on dividend payout increases in the future. Roche’s payout ratio still sits at a comfortable 60%, however. As someone who prefers defensive and long-term investments, it’s hard to pass up on Roche’s offering. Any dividend aficionado would agree that the Swiss pharmaceutical’s solid business performance, exclusive patents, innovative and marketable products in development, and reliable dividend growth make the stock into a possible corner stone investment of any passive income portfolio. 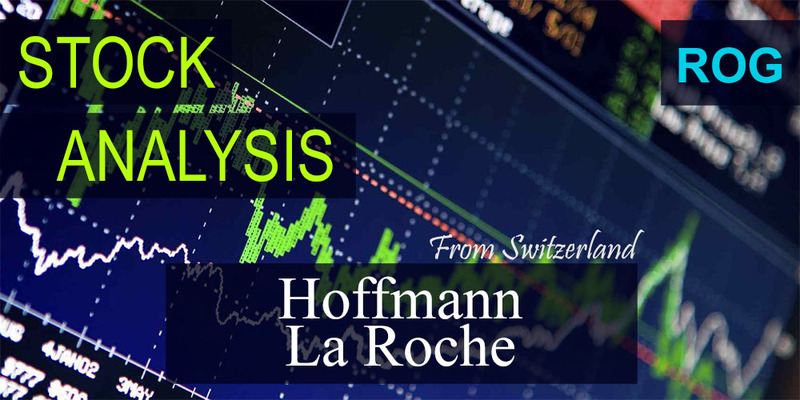 Even though Hoffmann-La Roche is based in Switzerland, international investors can buy shares directly from the Swiss Stock Exchange under the ROG ticker, but also in the form of an RHHBY ADR. Like many European companies Roche only pays dividends once every year. This policy slows the compounding effect when you re-invest your dividends, but it shouldn’t deter you from investing. One major downside to Roche’s Switzerland listing is the rather high foreign withholding tax Switzerland imposes on dividend income. Nevertheless, I’ll be looking to jump into Roche in the very near future. By doing so I’ll be adding a second Swiss health care giant to my portfolio after my purchase of Novartis last month. Do you consider Roche to be a good long-term defensive investment or would you rather invest in a different pharma company instead? I shy away from the Swiss companies due to their high tax rate but keep on circling back after reading your blog. 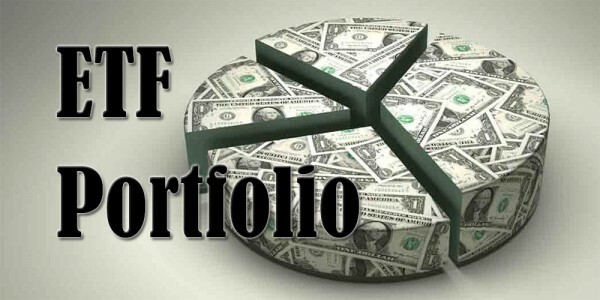 I am looking to add another non US holding to my portfolio and your blog and holdings has been very insightful. I am now tossing up which stock to add next as I have some cash available to invest. I understand the tax rate is something that could potentially keep investors away, but I don’t think it’s a reason not to invest in a good value business. If you’re looking to purchase European equities you are bound to run into foreign withholding taxes whether you like it or not. Hope you have some cash on hand soon and share your next purchase with us. The Swiss dividend withholding tax can be reclaimed substantially down to 15% or less. Absolutely true! It’s a bit of a mess to reclaim it though with lots of paperwork involved. Roche is a great company company and I have them on my watchlist. To my calculation the mean net margin of the last 5 years is 20.8 % (strong) and the 3y-rolling EPS growth rate is 4.4 % per year (ok). With a mean P/E of 18.1 and dividend yield of 3.1, the actual valution is rather high (P/E of 19 and 2.7 % yield). Furthermore, I have to read more about the company to understand their business model and the situation with their competitors. I like swiss companies and to get back the paid tax rate of the dividends is very easy. You can collect for three years the dividends. In the third year you fill out a paper ( download online by the swiss financial tax authority) about the amount of tax to get paid back and you have to get it signed by your tax authority of your own country. Per postage you send the document to the swiss and after 3-5 month you get back your money per bank transfer. I wouldn’t call that easy. Printing documents, having them signed, sending them via mail and waiting for couple of months reminds me of the 90’s. It’s like sitting in ants nest for couple of hours – mechanically easy task but in reality quite annoying experience. To me it’s hilarious and/or sad that it’s easier for EU citizen to maintain US portfolio than it is to maintain one with stocks from other EU countries. I sure hope the digitalization trend kicks in quickly. You’re right, it’s not easy! Luckily there are a ton of brokers in Europe that handle this kind of stuff for you so you don’t have to run from one place to another just to get a couple of documents signed. This conversation is very timely. I called up my broker to buy some shares in Munich Re yesterday. They told me they won’t do the paperwork for DWT. So I go to the German tax site and download the DWT form. I have to say it seems complicated and carries risk in my case. I am looking to buy Munich Re for my regulated retirement account in Ireland. The German DWT form says I must give my bank account details … but my retirement account uses my broker’s global bank account (I need to supply my personal reference as a side memo for the money to be linked with me). So not sure how this will all go down with the German tax man. And it seems this is something I must do every year? I would love to know has anyone gotten dividends paid at 15% DWT from Germany into a regulated retirement account? Netherlands has 15% DWT so is as good as US. UK has 0% DWT but has currency risk and GBP is expensive right now. Australia is 0% if dividend fully franked. Hong Kong and Singapore have 0% DWT … but will only take small position in emerging markets. Withholding taxes in Germany are a pain to many of us. In Belgium it’s not worth the hassle for many people unless your dividends are over €100 for every single position since there’s a lot of paper work involved like you said. I believe you’re right in that you have to file out the papers every year for Germany. As I don’t have a German position yet and definitely not over €100 in dividend income, I can’t say I received the 15% withholding tax for myself. Have you tried another broker in Ireland? Or maybe just contact your local tax authorities? Ah, I didn’t know that Australia also had 0% withholding taxes – great news! For Switzerland you can also get up to 20% of your withholding taxes back. My broker does this for me. Thank you for the technical analysis of Roche – that’s really not my thing. I’m more of a “do I like this business model and are earnings okay” kind of guy. 🙂 I’m glad we agree that Roche is an excellent pick though! Do you get all taxes back from the Swiss financial tax authority? I thought it was only up to 20% of the total 35% withholding tax? I have to contact my broker again to be sure, but I guess I’ll find out soon anyway. I do know that it’s a major hassle to retreive taxed dividends from Germany as it’s a cumbersome and expensive process. Hope that’s not the case for Switzerland. Novartis has a significant investment in Roche Holding. Novartis holding in Roche voting shares was 33.3% at December 31, 2014 and 2013. This investment represents approximately 6.3% of Roche’s total outstanding voting and non-voting equity instruments at December 31, 2014 (2013: 6.3%). You’re right! I didn’t know that until I looked into Roche more closely. I believe Roche will try and buy back some of its shares from Novartis over the course of the next years though. Thank you for pointing me towards some new stocks! I’ll definitely check them out and, who knows, maybe even add them to my portfolio at one point in time. I wouldn’t count on Roche buying back shares from Novartis. I rather think that Novartis is going to add some shares if there is any attractive purchase opportunity. I’m also a shareholder of GBL btw. I bought GBL a few years ago more or less as a “closed-end fund” with the opportunity to get investments in some big french companies at a discount. Do you consider to add GBL to your portfolio? GBL is a very stable and profitable option for Belgians looking to build a dividend portfolio. It basically operates like a fund, but is managed way better in my opinion. I have considered investing in GBL in the past and I probably will in the future, but with my current position in Total SA being so large already I don’t think it’s a good idea to increase my exposure. Very happy to see you analysis on Roche, which one of my favorite position that we will increase during the ex-dividend date, as you know the stock price will decrease by the amount of dividend distributed, so at current value, it will give us take or leave 250CHF per share. We plan to purchase share fore around 50k, that will bring down our average buying price and give us nice dividend growth next year. As you are planning to buy share, consider the ex-date, yes you will miss the dividend this year, but you will have a nice ratio between dividend/share price. I just saw your massive position in Roche! You own eighty times more shares than I do, wow. That’ll surely give you a hefty dividend payment at the end of this week. Even though people always talk about how stock prices go down when a dividend is being paid, my experience tells me otherwise. I don’t think Roche will drop significantly as it’s already on the lower end of its 52w valuation, even with the now free-floating Swiss Frank. Anyway, I’m glad to have added Roche to my portfolio yesterday and I hope it continues to do well in the future so we both can reap the rewards! Looks like an all around nice company to have, minus the foreign withholding tax. Healthcare right now is a great sector to be invested in because of the reasons you point out here and in one of your prior posts. In general the Swiss do an excellent job of national healthcare, as well as in the related marketplace. Stinks that I would lose so much in taxes on them in the US though. 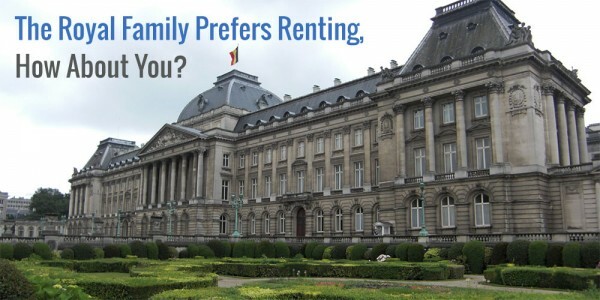 The foreign withholding tax is a bummer, but being a Belgian investor I’m used to paying lots of taxes. It’ll delay my progress a bit, but since there’s nothing I can do about it I’m not going to lose one night of sleep worrying about paying too much taxes. Let’s hope the Swiss health care sector continues to do well in the future! They truly have some remarkable companies on offer for us dividend growth investors. “Since the Swiss Franc is floating and is appreciating against other currencies”. Why then is my Mother’s Swiss Pension decreasing slightly in the last couple of month. Please don’t just copy what other people are writing, check the currency exchange rates. The Swiss Franc has changed very little versus the US Dollar. I’m sorry for any confusion. Could you point me to that precise quote, because I’m not sure where you got it from? Even though you believe the Swiss Frank hasn’t changed much compared to the US Dollar, I beg to differ. 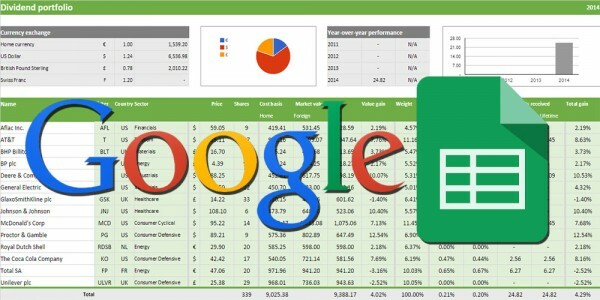 Just look at this graph on Google Finance: http://www.google.com/finance?q=chfusd&ei=zrIfVdGjI6KrwAPo4oGoCg. That’s massive volatility in just three months’ time. Do you know guys why i can’t find the historical data of this company stock? I mean, i can see the chart from ~ 2003 . I’m having difficulty too to find information on the usual websites like Google Finance and Yahoo Finance, but ROG’s own website offers a wealth information. My own broker also offers info from before 2003.
the 28 dividend growth years data is from their website ? 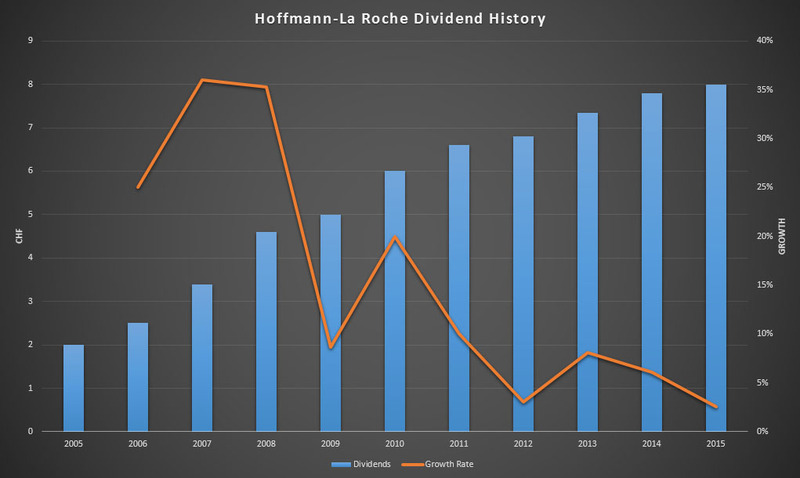 In Roche’s financial data and annual reports the dividend growth history is mentioned quite a lot and explained extensively. I recommend you dig through the latest annual report. Often stocks trade on multiple exchanges. In the case of Roche they’re all identical, I believe. However, you should be careful when purchasing on different stock exchanges because the trade volume and bid/ask spread could differ significantly. In the case of Roche I strongly encourage you to buy it outright from the Swiss stock exchange, especially if you’ve done so in the past. thank you for your response. Is very important what you say. I tend to buy it outright from the Swiss stock because no one can provide me information about this. I see in Roche website they explain to US people how to trade directly so maybe is okey for them. I must say that i haven’t bought from Swiss in the past. I know that is possible but regarding the Tax and whole fees i only can check it after 1-2 dividends payments. Do the tax withholdings apply if you buy RHHBY in a Roth accounts?